An autumn day in Vermont can mean a sea of color, even if the sun doesn't cooperate. This anniversary session of a couple who were married several years before took place on a gray fall day near Woodstock, Vermont, a quintessential New England town that has beautiful wedding venues such as the Woodstock Inn. A Vermont wedding has the distinct advantage of being beautiful no matter what the weather ends up being, as is showcased in this image by a clean palette of yellow and the carpet of fallen leaves that have started to brown. The Woodstock Inn is nestled on the Green in Woodstock, just across from an antique covered bridge, and down the street from small shops and restaurants, making it the perfect weekend retreat for out of town guests and family. Keeping a casual and relaxed feeling throughout all of our portrait sessions, whether they're on a wedding day or scheduled for an open afternoon or evening, is one of our highest priorities as image makers, as it brings a feeling of genuine connection when the clients are able to enjoy themselves and not worry about posing. 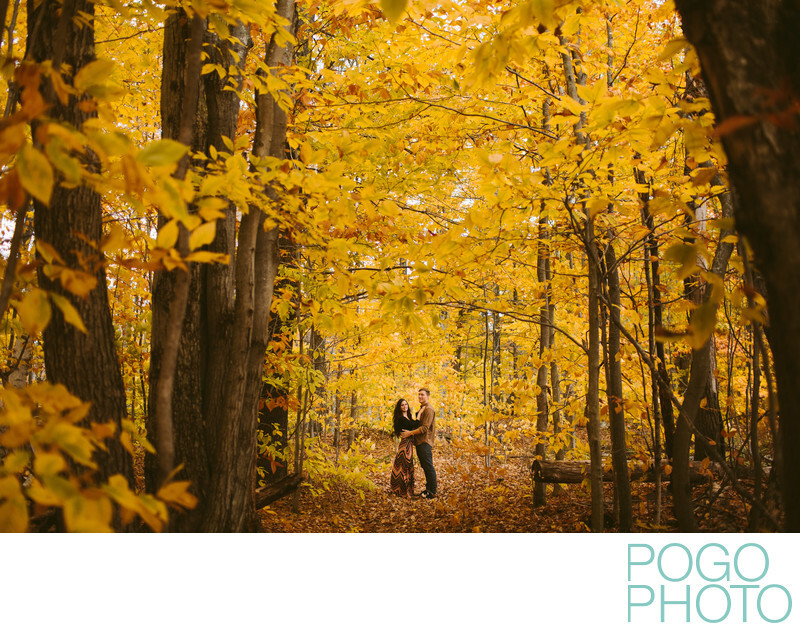 This image highlights the surrounding area through the use of color, which was helped by the couple wearing clothing that let them blend with the fall landscape, and composition. Placing the couple in the lower center of the image and allowing the surrounding trees to lead the viewer's eye to the brighter center vertical third of the image makes for a direct and memorable composition. 1/1250; f/2.0; ISO 400; 35.0 mm.